AICA (anterior inferior cerebellar artery) strokes. The AICA syndrome usually presents with vertigo and unilateral ipsilateral deafness from labyrinthine artery ischemia. Large strokes are accompanied by ipsilateral facial weakness and ataxia. It is the second most common brainstem stroke, about 10% of PICA frequency. The extent of this stroke is extremely variable. Symptoms similar to Meniere's disease (fluctuating hearing, tinnitus, vertigo) can also be caused by impending TIA's in this distribution (Lee and Cho, 2003). Bilaterality of hearing fluctuation suggests a vascular cause, but most AICA strokes present with unilateral hearing symptoms. 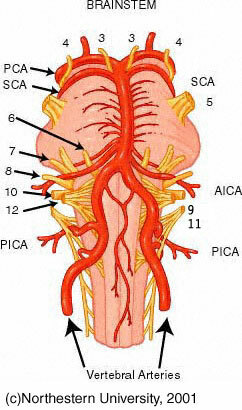 The AICA also has a very variable origin and may take origin from the caudal to middle pons. AICA territory strokes may also present with vertigo alone. Diagnosis is generally via MRI.